November « 2010 « Robots and Brain Bots Inc.
We just received our new parts in the mail! We got a gyroscopic sensor, a magnetic sensor, and some new hardware. The motor controllers are out of stock! It’s not a good time for something to be out of stock….During the scrimmage over last weekend, Ben was able to program the gyro sensor to measure the angle from the calibration use a lot of intricate equations (the gyro sensor puts out degrees/second). It took him a while, but he figured it out, and it works really well. 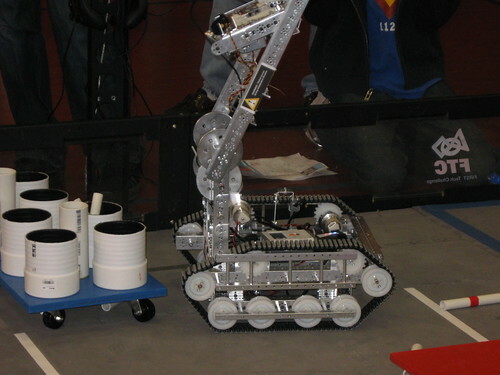 He tested the gyro by making a program for the robot so that we could control it by tilting the gyro sensor. We are working on more designs for the baton dispenser and holder, but we don’t have the parts to prototype them. 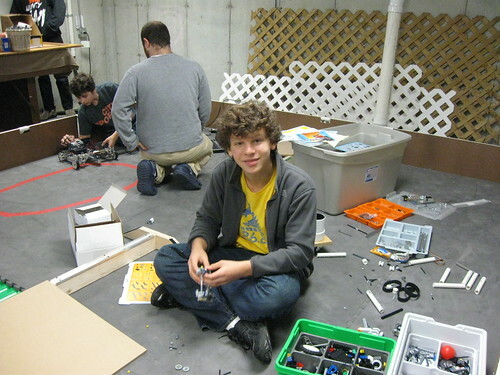 While Ben was working on the gyro program, the other Ben was working on a joystick control program that worked really well. On the hardware side, we just order a load of parts, although the motor controller and resource kit are still out of stock, which gives us a lot of complications. We hope to have the prototype for the base of our robot done by December 1st. Wooh. Big robots. We just had our first scrimmage today, and we had a look at our first robots that we would be competing against. Our first reaction was, wooh, those robots are big and complex. Our current test robot could only go up in the bridge, thats it. We don’t even have any extra parts yet! The table to the right of us had a robot that looked complete. It was slightly intimidating. After we got over our inital shock, we started to look around at other designs for robots. We saw mostly 6 wheel, or 4 wheel drive robots, and we saw one omni-directional robot (which made us feel way better about our design). We also saw a few methods for how to get the batons out of the dispenser, though we didn’t see that many that worked…. There were many designs, and I think that it’s pretty awesome. So….to all FTC teams out there, keep on building!! Good luck guys, everyone is cheering for you. We had our first working robot, but now we are starting to work on some prototypes for the arm and the baton holder. We worked on some light following techniques, and ultra-sonic tracking and driving. Nathan is currently working on the “arm” (or the baton-dispenser) for our robot, and I (Sam) am currently working on a design for the baton-holder to be lifted and turned to drop the batons out of our holder. Ben(x2) are working on the lint following techniques and ultra-sonic tracking, and they’ve made it pretty far. They have been able to track a person, follow a line, and do both simultaneously. Aaron is currently working on baton holder 2.0 built out of lexan.